There are hundreds of tricks using the paddle move, and the Jumping Peg Paddle is one of the oldest and most effective. The performer displays a small bat or paddle with three holes going through it. A piece of match stick is pushed through the hole in the middle, and the paddle shown freely on both sides to show it goes through the hole in the middle. In an instant the stick jumps to the hole on top. Paddle is again shown on both sides, and a spectator can be invited to pull out the stick from the hole on top, and again push it into the hole in the middle. In an instant the stick jumps to the hole at the bottom. You can make the stick jump from hole to hole (top to middle, or middle to top, or middle to bottom, or bottom to middle etc.) as often as you like, making your routine as long or short as you wish. The paddle is shown on both sides at any point. Although not a new effect, this is an excellent one, and we have made it in a quality and finish that does justice to this wonderful pocket trick. The paddle is made from almost un-breakable plastic measuring 4.5″ long and 0.25″ thick. The edges of the holes are coloured in different colours to create an additional impact of the stick jumping from one hole to the other. 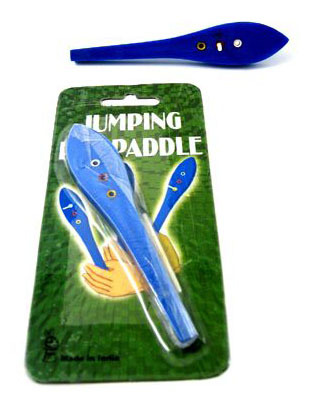 Jumping Peg Paddle is very easy to do, and a trick you can carry in your pocket, ready to perform at any time. It comes to you complete with full illustrated instructions, including the paddle move.